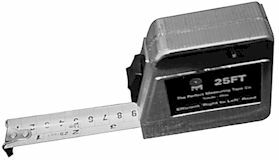 The Perfect Measuring Tape Company has been providing precision measurement systems for over 80 years. We are pleased to offer you their imported tape measures. 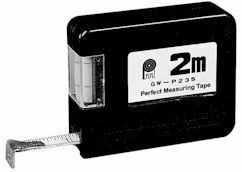 The P235 is a plastic case measuring tape with a level on the side. Yellow blade tape is 1/2" (12.5mm) wide and 6' (2m) long. Graduations are Inches/Millimeters. The price of the P235 is $2.50. The RL series is a special "right to left read" tape - not just for left handed people but also for right handed people who prefer to hold it in their left hand, freeing the right hand to make notations and markings. Yellow blade is 1" (25mm) wide and 25' (7.5m) long with a lock to hold the measurement. Graduations are in Inches/Millimeters. The price of the RL01 is $19.95. 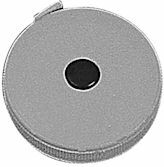 This pocket size tape measure is a 60-inch white fiberglass retractable tape with inches in 16ths on one side and centimeters on the other. Available in red only. Perfect item for imprinting your company or your customer's name and logo. Call for details on the imprinting. The price of the SR1 is $2.25. The L.S. 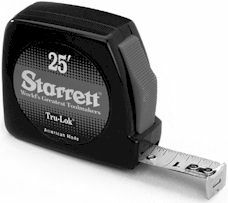 Starrett Company has been a continuous symbol of leadership and dependable service in the manufacture of fine precision tools since 1880. 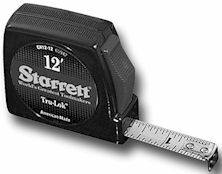 These precision tape measures come in impact resistant, rugged cases. The reliable Tru-Lok® gives positive locking. These are American made with heavy duty blades and durable stainless steel belt clips. This easy to read scale show the different weights for book, bond, and cover stock. 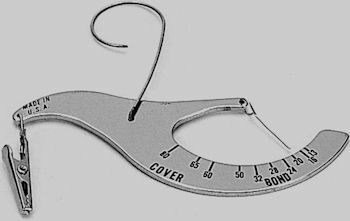 Hang a sheet of paper from the clip and the pointer indicates the weight of the paper. Comes with a carrying pouch and instructions. The price of the 7070 is $17.95.